Why are our highways built the way they are? What makes driving safe, or at least safer? Is speed alone dangerous, or is it contextual? 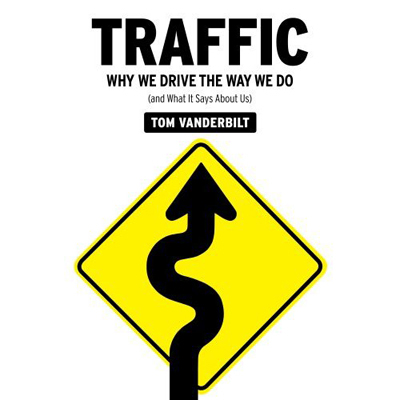 Tom Vanderbilt’s Traffic: Why We Drive the Way We Do (and What it Says About Us) is one part research investigation, one part history, one part psychological analysis, one part cultural analysis, and 100% fascinating. As a fellow amateur transportation enthusiast, I admire Vanderbilt for his drive to self education on the systems we all participate in. I highly recommend the book to the transportation enthusiast and casual reader alike. The book does far more than describe our roads and how they work. Vanderbilt shares dozens of fascinating tidbits that will amuse and amaze you and your friends. More importantly, he sheds light on human behavior and American culture. Roads in and of themselves are rather characterless; what matters is how we use them and how those roads shape us as individuals and as communities. After all, is there really a difference between old suburban and city roads with their right angle intersections and roads and communities developed over the last 50 years with their sweeping gentle curves? Is one safer than another? After all, all roads with cars traveling on them are inherently dangerous. Cars are multi-ton machines carrying delicate human cargo, all while moving at speeds evolution did not prepare our bodies to handle. Our bodies are not evolutionarily designed to handle the challenges of observing our surroundings at those speeds, or handling the trauma of collisions at those speeds. It turns out that the old roads are safer, with their definite intersections, because cars are forced to stop and look, rather than casually yield. Similarly the straight roads typically leading to these intersections provide for better sight lines when looking down the road and anticipating oncoming traffic. All of this means that our older, pre-automobile designed roads are actually safer – for both the driver and the pedestrian – than the road designed with modern cars in mind. Vanderbilt peers inside the mind of the driver and exposes just how amazing it is that we can drive at all. It is amazing what we can see when we are driving, and how we can coordinate our sight and muscle movements at the fast speeds of the interstate. However, with such miracles come some real challenges. This book will be sure to make you rethink not only how you drive, but why you drive, and how our policy shapes our communities. Traffic does not preach and does not lecture. Vanderbilt’s adventures with bureaucrats, scholars, and business people illuminates what makes driving fantastic, what makes it dangerous, and how our culture is shaped by an activity we largely all take for granted. On a different note, I apologize for my extended absence from this blog. My last semester of law school took control of my life. I will be working rather than studying this semester and anticipate dedicating much more time to this blog. Thank you for your patience and continued patronage.